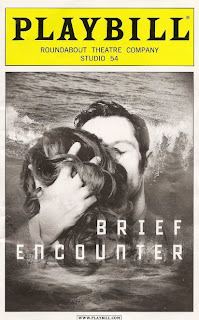 Brief Encounter is a production of the Kneehigh Theatre Company out of Cornwall, England. It made three US stops, including at the Guthrie Theater in Minneapolis, before landing on Broadway at Studio 54. I saw it in March of this year and absolutely loved it, one of my favorites of the year so far. It’s innovative, fresh, and perfectly lovely. I didn’t notice any differences between the show I saw at the Guthrie and the one I saw on Broadway, except for a few casting changes. It’s a nine-person cast, some of whom function primarily as musicians and some primarily as actors, but almost all of them do some of both. Brief Encounter is technically a play (it was listed as such on the TKTS board), even though it contains just as much music as a musical. But it’s more like a play with musical interludes, rather than a traditional musical with characters breaking into song. It’s based on the Noel Coward play Still Life as well as his movie adaptation, Brief Encounter. It uses film and music to help tell the story of two people who meet at a train station and fall in love, despite the fact that they’re married. Their romance is doomed from the start, but that doesn’t stop it from being beautiful, life-changing, and buoyant. There are frequent little vignettes in the show that interrupt the main action of the play, which makes it feel almost vaudevillian. Here is where the ensemble cast shines. Before the show starts they walk around the theater, dressed as 1930s movie theater ushers, and singing and playing songs of the period. They all play multiple characters and multiple instruments. The sweet and funny “new love” story between Stanley and Beryl and the “love again” story of Myrtle and Albert serve as a nice contrast to the doomed love story of the main characters. Brief Encounter is innovative in the way that it uses media to depict the inner and outer action of the story. There’s a screen at the back of the stage where images such as sky or water are projected. At times scenes are projected onto a smaller screen made of vertical strips at the front of the stage, allowing the actors to step in and out of the picture. The train is depicted as a little toy train pulled across the stage, and also by a projection onto yet another screen pulled across the front of the stage. At one point the lovers literally swing from chandeliers. There was a Q&A after the show, and one of the actors commented that what is normally felt internally is expressed externally in this show. Every movement is so specific, so full of meaning, that not a moment is wasted on any corner of the stage at any time during the show. From the way someone holds a teacup, to a gentle touch between lovers. It’s a delightful show that will break your heart, make you laugh, and give you hope. It feels like something that should be done at some little experimental theater, which I think it was, and I’m thrilled that it ended up on Broadway. Update: watch a video about opening night here.